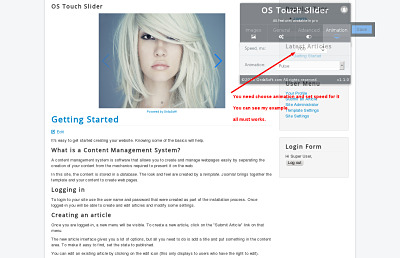 I have your free OS Touch Slider which works well but in my case - I can't get the animation to change. The only other animation I seem to be able to get is "zoom in"? When I select NO to stop on last slide it also seems to revert back to "slide"? You need choose animation and set speed for it in the tab "Animation"
Also, you can see how configured our demo, you look and set the same settings. Last Edit: 2016/09/20 11:44 By Taras.